Pondering an Apple computer solid-state drive upgrade that uses a mSATA SSD form-factor? Although Apple NEVER used this type of widely standardized SSD card in any of it's computers, they were and still are very common in PC notebooks. That said, there's still ways to for Mac users take advantage of their small size and speed. For those with older MacBook's or Mac mini's that used conventional 2.5 inch SATA notebook drives, a very affordable 2.5" SATA to mSATA adapter can be used to retrofit a mSATA card to a standard laptop drive form. 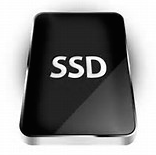 There are also Apple users who might want to explore mSATA based SSD backup drives for their OSX setup. Ready made storage solutions often referred to as 'Pocket Drives' can be bought in a variety of standard 128GB / 256GB / 512GB / 1TB capacities. They can be used formatted as-is for cross-platform PC/Mac use - or reformatted in Apple's disk utility for optimal use strictly on Macintosh systems. You might want to cobble together your own mSATA Mac backup drive using any number of USB 3.0 or USB 3.1 Type-C interface mSATA module drive enclosures available for only $10-$20. Note, make sure 'UASP' protocol is supported in the enclosure to insure your solid-state Apple mSATA based backup drive performs optimally and gets the best data transfer rates possible.